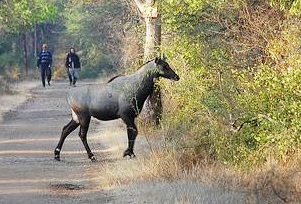 It's hard to believe that within few minutes from teeming Bhavnagar one can be surrounded by this 2-sq-km protected forest. On the edges of the Gaurishankar Lake lies the well-conserved Victoria Park. Sprawling over two sq km, Victoria Park was designed in the year 1888 by Mr. Proctor Sins for Maharaja Takhtasinhji of the Bhavnagar city. Here, bright flora, birds, butterflies and elusive fox population greets everyone. Trek through the lush green forest and if lucky, here one can spot birds like Bulbuls, Green Bee-Eaters, Robins, Tailorbirds, Silverbills, Peacocks, Sunbirds, Spotted Owlets, Shikra, Rose-Ringed Parakeets, Common Peafowl, and animals like Nilgais, Foxes, etc. The biggest species found in this park are Leguminoceae and Poaceae. There are 223 bird species, 15 mammalian species and 20 reptile species. Inside the park, there are some nurseries where one can see some unique variety of plants. There are two water bodies inside — Gaurishankar lake and Krishna Kunj lake (remains dry most of the time), where a large number of migratory birds nest regularly. Recently, a picnic site is developed inside the core area of the park with many benches, picnic tables, and concrete block pavements. Multiple types of accommodations are available nearby the park for tourists.